We LOVE our dog walker! She’s so awesome and came highly recommended from a friend who also used her when they were in Portland. Amy is the owner of FurEver Family Pet Sitting. Bella loves her! We are so happy to have found someone so great to come and walk Bella a few times a week while we are at work. It makes a huge difference. On days we don’t have Amy come over, I can tell a difference–Bella is a super spaz all evening after being cooped up. Bella’s behavior has also improved because Amy continues the training we are doing with her (i.e. not pulling on the leash on walks, not jumping on guests, etc). Another bonus: I get a mid-day text report of Bella and sometimes a cute picture. 🙂 It brightens up my work day. Amy posted this comment on another post I wrote and it was a great blog idea! I’m struggling right now with finding things that I can eat in the car on the go. I’m ok with ‘ruts’ and eating the same thing day in and day out, but I just struggle with ideas that are healthy and I can keep in my car for up to 8-12 hours some days. I know I just need to PLAN and fix ahead so I can grab and go…but looking for new ideas! While Amy’s situation is probably unique compared to a lot of my reader’s daily work lives, I think everyone can relate with running out of ideas for easy snack and on-the-go meal ideas. Trail mix -This one is iffy because the calories can really add up! 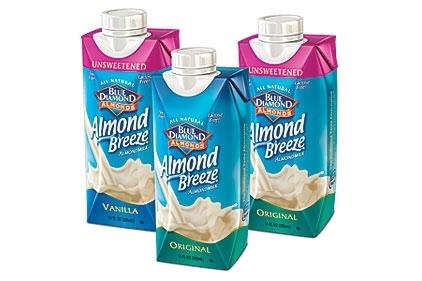 Single-serving chocolate Almond Milk – I love this stuff! I decided to give something a try I’ve vowed to do for a long time now–ever since I saw it on Pinterest. The egg “muffin” for breakfast. I’ve seen dozens of variations and you can really do whatever you want with it and make it your own. It’s something that you can make on a Sunday afternoon and have for the work week for a quick breakfast or a snack. I used this recipe as a jumping off point. I made some alterations for my own personal preferences and also combined a neat idea I saw in another similar recipe–using some frozen hashbrowns as the base of the muffin. Preheat oven to 350 degrees. Steam or boil broccoli to desired tenderness and chop. Whisk together eggs, egg whites and milk. 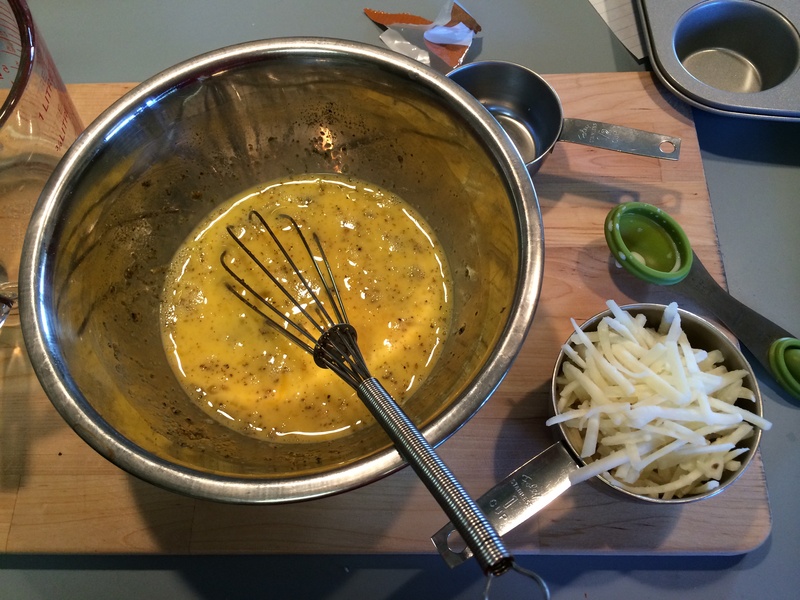 Season egg mixture with salt and pepper and stir in cheddar cheese. Spray muffin tins with cooking spray. Layer about a tablespoon of chopped broccoli into each muffin cup. Pour in egg mixture to about 3/4 full and top with remaining grated cheese. Bake until set in center about 20-25 minutes. Note: We also love them with baby spinach and roasted mushrooms. Use whatever cheese and veggies you enjoy to customize these for your taste buds. With the alterations I made, my muffins came out at 145 calories each. I was okay with that number. 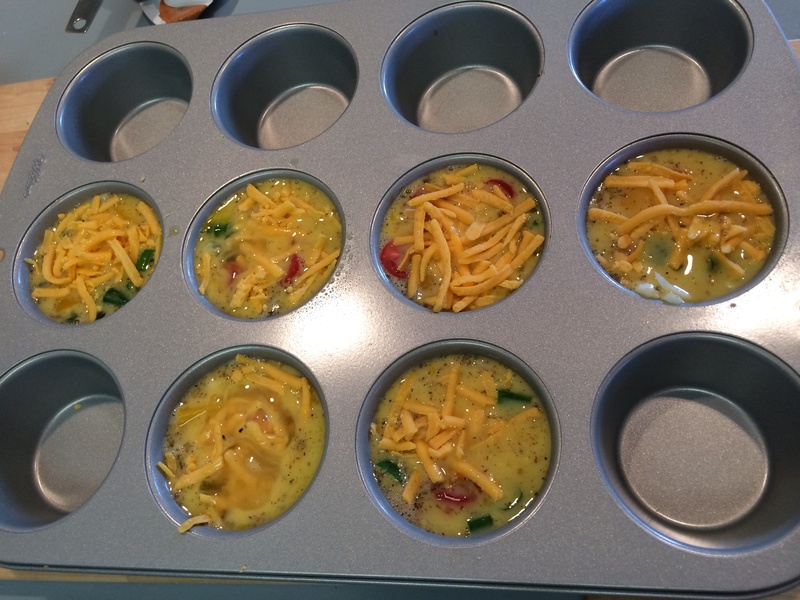 My muffin had green onion, yellow and orange diced peppers, some shredded sharp cheddar cheese and sliced grape tomatoes. I baked the egg muffins for around 30 minutes and tested them with a toothpick until I decided they were cooked through. How pretty do those look? Don’t mind the lone muffin that apparently got all the egg whites in one section. 😛 Despite that, they were tasty! I already have some ideas on different recipes–maybe artichoke hearts, tomatoes and feta cheese….yum! 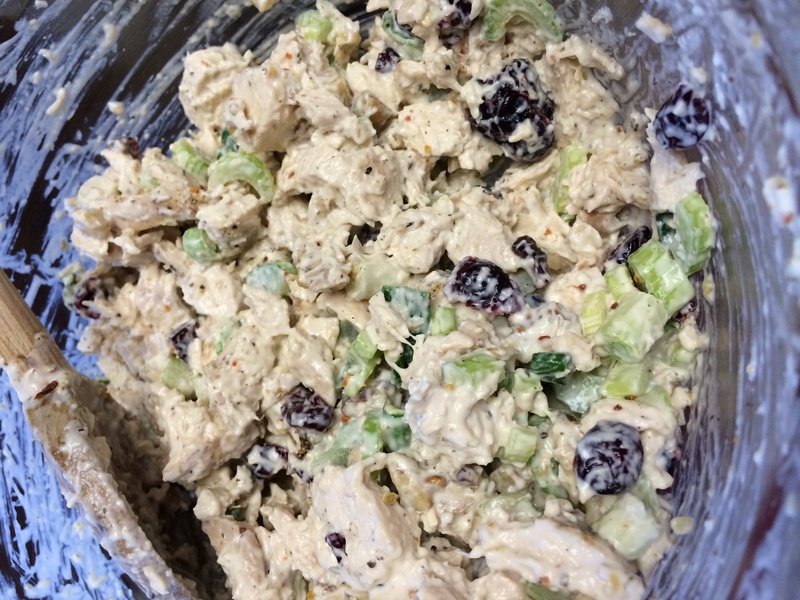 I also made some chicken salad for lunches at work. I made some alterations and omitted the apple to reduce the calorie count slightly. I planned on topping some spinach and green leaf lettuce with the chicken salad mixture. I used 5 tablespoons mayo instead of 6, omitted the apple and the cooked chicken breasts came to 2.5 cups instead of 3 so that made the calories about 260 a serving. Combine the chicken, cranberries, celery, onion, apple, and walnuts, if using. In a cup or small bowl combine 4 tablespoons of mayonnaise. the lemon juice, curry powder, if using, and salt and pepper. Stir into the chicken, adding more mayonnaise as needed and for taste. Line bread or rolls with lettuce and spread chicken salad on the bread or serve the chicken salad on lettuce-lined plates. I had a few nibbles of my chicken salad before I put it in tupperware for lunches. It was really tasty! I like the crunch of the celery and walnut and the sweetness of the Craisins. 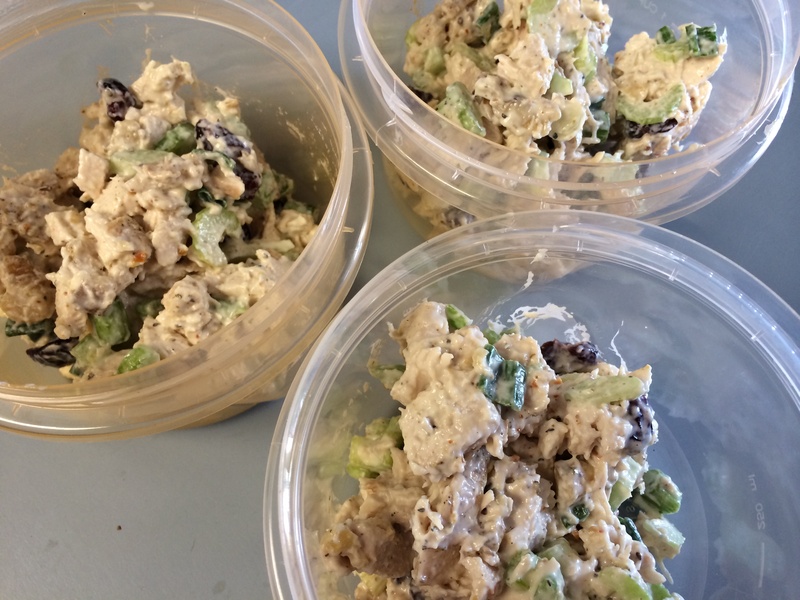 I enjoyed the chicken salad lunches and I’m glad I finally gave it a try. I’m going to experiment with other recipes and see if substituting Greek yogurt for the mayo might work too. In one afternoon I prepped my breakfast and lunch meals for the work week and it was a success! It was easy, didn’t take much time to prepare on Sunday and saved me a lot of time in the mornings before work. What are your time-saving ideas for quickie meals? I’ve seen those egg muffins on Pinterest before and always think about trying them. Glad to hear from a “real life” person that’s tested out the recipe. I’ll have to finally make some! Courtney @ Don’t Blink. Just Run. recently posted..Diet S.O.S. Next time I would add some turkey sausage or something to it. 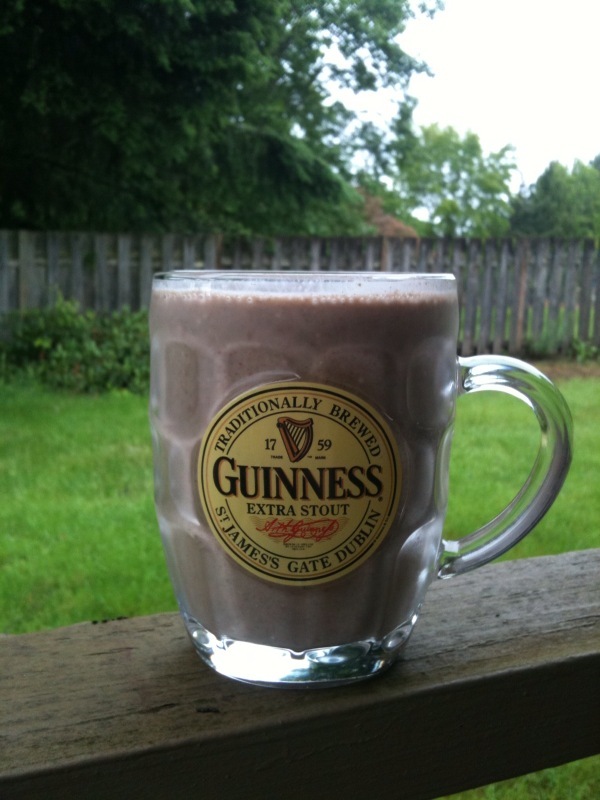 It needs a little more protein, but other than that it’s delicious. 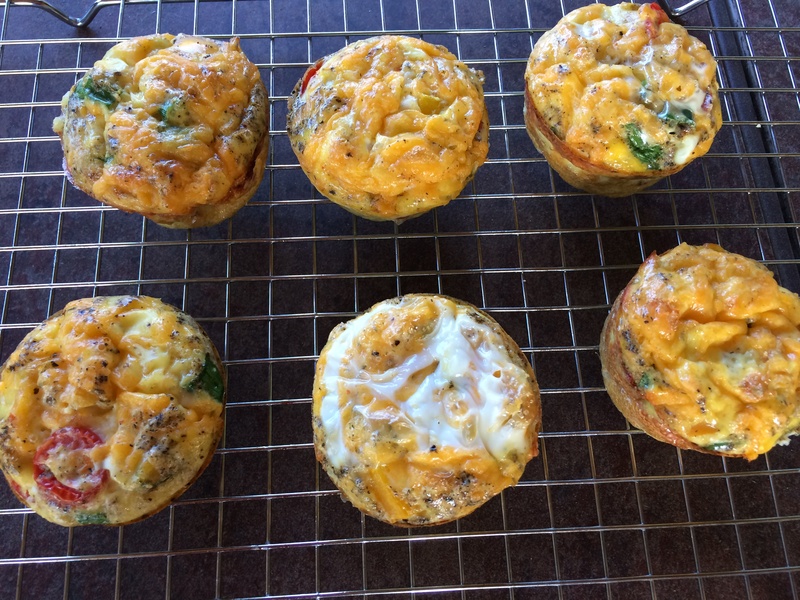 Funny – I do the egg muffins when the boys have friends over at breakfast since they can all customize 3 or 4 each but I never thought about doing them as a make ahead breakfast – great idea!! Kim recently posted..Snow Days – Productive or Play? I’ve been eating them all week for breakfast and they are working great! Quickie meals for me are usually leftovers LOL! I usually make one large dish or at least a bunch of cooked chicken to make it easier. I will say that Balance Bars have saved me in a pinch many a time. I love to follow your blog and your menu choices are helpful. With the chicken salad you said you made it for the week and put it in Tupperware. Does it stay as tasty on the 5th day as it did on the 1st? I love the idea of doing a week’s worth of meals on the week-end. Who wants to spend time daily thinking about meals! Yes! The chicken salad and the muffins are still tasty and holding up. Today is day 4. I’ve been making fruit/veg protein smoothies and putting them in mason jars 🙂 Trying really really hard to be healthy. Marilyn @ Lipgloss+Spandex recently posted..YAY!!! RUN ALL THE RACES! Max has a date with Amy on the 15th, and he’s pretty excited. I think he’s going to make her a Valentine. (hi Amy). I’ve heard the egg muffins are also good with cottage cheese. I think Kalyn’s Kitchen has the recipe. I also went through my weirdo flax muffin phase but they’re a little dry to take on the road. I’m still loving my juices lately, fresh from home or Evolution Fresh. I swear the nutrients cure cravings and keep hunger away (they have to be mostly vegetables). Oooh love the idea of cottage cheese!! Luna Bars are my favorite protein bars. Egg muffin?! I don’t know such food exists!. It seems so healthy, yet very delicious. I would love to try this. I’m sure my boys would love it, most especially that they love eggs. 🙂 Thank you!